Hare Krishna. I think you all may have noticed that there is some construction going on there – this was one of the dear-most projects that Srila Prabhupada emphasized on. It was one of his most intimate offerings of his life to guru parampara and to build such a beautiful temple that people throughout the entire world would come: come to associate with devotees, participate in Nama Sankirtan, hear hari katha, take Krishna’s Prasad, and be purified by the unlimited grace that is emanating from the holy place of Mayapur, the place of Lord Chaitanya, Lord Nityananda, the Pancha-tattva’s eternal pastimes, the place where the greatest of our acharyas or the greatest spiritual preceptors came to perform their own devotion, the birth place of the sankirtan movement. Today kirtan is becoming very famous all over the world. According to our scriptures, Navadvip is the birthplace of kirtan – vijayate Sri Krishna Sankirtan, the prime benediction for all humanity. The age of kali is an ocean of faults when compared to this ocean of kali, the Atlantic, Pacific, Bay of Bengal, Arabian, are like little pots of crippling influences, this is a fathomless ocean. There is one benediction in this age of kali– that simply by performing sankirtan, chanting the holy names of god, one can attain the perfection of liberation, in common terms liberation means to be free from the dualities of material existence, which bounds to the attachments… free us from suffering, frees us from birth, old age, diseases and death. But that’s just a preliminary state of transcendental consciousness. 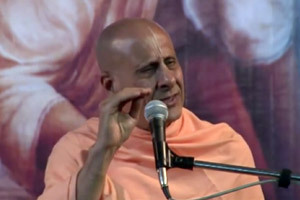 Haridas Thakur explains that the ultimate goal, the real true perfection of liberation, which can be revealed from within our hearts when we chant Krishna’s holy names, and Krishna has many names, is ‘prema’– the awakening of the ecstatic love, love for Krishna, Sri Radha, all living beings who are the children of Radha and Krishna. It is our intrinsic nature that love is ever increasing and is forever. It is our intrinsic, inherent nature. änandämbudhi–vardhanaà prati–padaà pürëämåtäsvädanaà, it is the happiness that everyone is seeking, that is the benediction of kirtan. There are many avatars, many incarnations of the lord, who have come throughout the world throughout history in different times and places to reestablish dharma, sanatana dharma, and true spiritual principles, to remind us of what we have forgotten– that we are all eternal souls, parts of God and this world is the perfect place to cultivate that God consciousness, if we have proper vision, proper guidance, and proper motivation. But of all the great incarnations, lord Chaitanya is considered to be most magnanimous. Now this is something of a contradiction! But spiritual knowledge is full of perfectly harmonious contradictions, wherein there is no contradiction. One time a great scholar of Vedas in the western world said to Srila Prabhupada, among the acaryas, the saintly teachers, there are so many contradictions. And Prabhupada said, “There are no contradictions.” But there appear to be! So if there is one God, how can that one god be more magnanimous than himself? Because all the avatars are Krishna. Kurma, Varaha, Narasimha, Vamana, Rama, Balarama, they are all Krishna, so how is he more magnanimous than himself? Because as lord Chaitanya, he is coming in the role of own devotee to teach us by his own example, how to love Krishna. And he is giving the most intimate level of love of God freely, something that is so rare to the most exalted Paramhamsas. He has brought in the age of kali the love of the gopis of Vrindavan, and what is the price, a humble and grateful heart and chanting the holy names of the god with good character and a true desire to serve, that’s all. Anyone can do it, therefore the Bhagavat tells us that the greatest sage and rishis worship and honor Kali Yuga as the best of all times. It is the time of the most suffering, the most hypocrisy, the most quarrelling and fighting, but the greatest benediction is given in all of that. And that benediction adverted especially here in this Sri Mayapur Dham. Prabhupada was thinking of this temple, when he didn’t even have any money. But he understood that it was the will of the previous acaryas. Long long ago, the greatest acharyas were talking about an Adbhut Mandir, a glorious temple that would attract the world. Today we have a presentation, on Srila Prabhupad’s disappearance day, there is going to be an elaborate presentation. Today just a small presentation of how each and every one of us can be a part of it. But to really be a part of it means to put your love and devotion into it. And to put you love and devotion into it means some sacrifice. Srila Prabhupada considered this so important, so divine that he wanted to give a chance to everyone to participate. In lord Chaitanya’s pastimes we read about King Prataprudra, the king of the whole state of Orissa. He utilized his whole treasury, powers, and influences to serve lord Chaitanya. And then we read about Suklambar brahmachari, who is just a little brahmachari who live in a little straw hut a few minutes away from here on the bank of the Ganga. He had nothing, he was a true brahmachari, according to the classical sense. He didn’t even have a cell phone, can you imagine a brahmachari so renounced? He would go out to beg, and he would go to about 10 or 11 houses to beg. Minimum – he didn’t want to take too much from any house. And he was constantly chanting the holy names of the lord. He was wearing little raggedy clothes. Whatever rice he would collect, it was usually the… Most people don’t give beggars the best things in their house, most people give beggars a hard time, they just ignore them– Get out from here, Hut, maybe just to get rid of them, with some pious sentiment they just give the worst thing. Something. People usually take the broken old dirty kind of pieces of rice to give to beggars. Once at the house of Srivas, when lord Gauranga was performing his kirtan, he sat on the altar. One of those rare precious moments, where he was actually fulfilling his devotee’s desires, where they could make offerings to him otherwise he was always making offerings to them. As the kirtan was going and all these incredible personalities were singing, and dancing, lord Chaitanya saw little Suklambar, somewhere in the back of the kirtan and he was just blissfully chanting Krishna’s names. He had no money, no prestige, besides lord Chaitanya nobody even knew that he was an advanced devotee. Everyone just thought he was an ordinary beggar. But he took all that rice, took it home, he cooked it in a little pot, offered to Krishna. He would be in transcendental happiness and here he was tasting the sweetness of the holy names, his heart bursting with bliss, dancing. In the kirtan of real bhakti, dancing is not some sort of step like the dances in this world, every movement of every limb is an expression of our gratitude and our love for Krishna, who has appeared in this name. We are actually immersing, absorbing our body, mind, words or very life as an offering of surrender, devotion and love to Krishna as they were chanting. As he was chanting he had this cloth bag, an old tattered bag that he would beg with. It was at his shoulder, and was swinging back and forth in all directions as he was dancing, and lord Chaitanya looked at him and smiled. It was such a sight! He was just so simple, so innocent, dancing like a child, with his little bag flying around. Lord Chaitanya called him, “Suklambar came forward” and lord Chaitanya he said, “Birth after birth, you are my beggar devotee. And I’m hungry for whatever you beg.” And everyone in the room was thinking ‘What is he talking?’ Then Sri Chaitanya Mahaprabhu, he had long arms which extended beyond his knees. If he wanted to take something from you or give something to you, nothing could come in between his will. He thrust his beautiful golden hand into the bag and came out with a handful of broken pieces of the cheapest quality rice. It wasn’t even cooked and cleaned it was just what people threw in the bag, they just threw it in. And lord Chaitanya ate it. Suklambar was – “How could you eat this, my lord? It is not fit for you.” And all the devotees were shocked. Sri Chaitanya, there were tears, streaming from his big, beautiful, lotus like eyes, reddened with affection. He said,” I have never tasted anything so sweet, as the rice of Suklambar.” Then he thrust his hand again, and ate handful after handful. So whether like king Prataprudra, we offer palaces and treasuries or whether we are like Suklambar brahmachari and we offer broken pieces of rice, it is our devotion that the lord accepts. And it is that devotion that gives quality to whatever is offered. In this temple, it was Srila Prabhupad’s will that people who have much could help with much as an offering of love. Not because of pressure. Not because of having your name written forever, out of love. Whether it is a paisa, a crore, through our intelligence, through our abilities, Srila Prabhupada wanted all devotees from all around to be united in this great opportunity to expand lord Chaitanya’s mercy and the Sankirtan movement throughout the world. So my very, very dear friend and brother Radha Jivan Prabhu. He is recently connected in a very enthusiastic, dedicated way with my dear god brother Ambarish Prabhu and others in the team of this project. And he is going to present a blessed opportunity to all of us. Let us welcome him by loudly chanting ‘haribol’. In this story we told about Sukhlambar Brahmachari. One interesting truth in that is that he never even offered the rice, the Lord stole it because Krishna is so hungry for the love of his devotee. We all have heard the story of when once Krishna was in Hastinapur; Duryodhana invited him to be his special guest of honor in a magnificent palace, he had arranged for a feast from the finest master cooks which would be served on Gold and silver bejeweled plates. He had gifts of ornaments of the precious most materials. He had entertainment planned of musicians and dancers, the best of the world. Krishna walked right by his house, because, īśvaraḥ sarva-bhūtānāṁ hṛd-deśe arjuna tiṣṭhati, Krishna is in everyone’s heart. He doesn’t see what we offer him; He sees the purpose in which it is offered. He is bhava-grahi-janardhana, He accepts the quality of our love. He doesn’t need anything else. The Lord is ‘Laxminath’, “Sarva Loka Maheshwaram,” He is the proprietor of everything that exists. He is the husband of the goddess of fortune. What does he need? But he is hungry for the love of each and every one of us– That is how God is great. The fact that the one supreme truth can create unlimited universes, can be the father of all living beings, is the source of everything exists. But what’s even greater, although he is Parmaishwara, Parbrahman, he is hungry for the love of each and every spirit soul, a little you and me and everyone else. When we awaken that selfless spirit of love in our heart, Krishna is hungry to taste it. How great is that? He is so hungry that when there is love, he may not even wait for it to be offered, he comes and steals it. So Sukhlambar Brahmachari, he did not have a bell, that he was ringing it, chanting mantra, tantra, mudra, puja he didn’t do anything but Lord took his rice because he was eager to taste Sukhlambar’s devotion. So when Krishna was walking by Duryodhana, He understood Duryodhana’s heart. Duryodhana wanted to please the Lord so that he could get Lord on his side, so that he could execute his envious plans for the Pandavas. So Krishna did not care about all the jewels, silk and fine food, he just walked right by. But he was hungry, he was hungry for devotion. So he went to Vidura’s house. She didn’t even had any food in the house, all she saw in the whole house was one banana. She was so nervous that she peeled the Banana, throw the banana out and gave Krishna the peel. Krishna ate it and enjoyed it profusely. He would rather eat the banana peel from the hands of a loving servant rather than a royal cuisine from someone who has ulterior motives. So that is Bhakti, that is Krishna’s greatness. And Krishna descended into this world, in this age of Kaliyuga, as Lord Chaitanya especially to enlighten us with what he called the purushakta shiromani, The Crest jewel of all goals of life, the Prem Nidhi, the ultimate wealth of love. Most Avatars are expansions or the expansions of the one lord. You see that lord is one, but reveals different quantities & qualities of his infinite, unlimited compassion according to time place and circumstance. The concept of ‘Achintya Bheda Bhed Tatva’ – Inconceivable oneness in difference, it is all encompassing philosophical principle. Every living being, the living force within all our hearts, that living force that’s me and you, that sees through the eyes, hears through the ears, tastes through the tongue and smells through the nose and touches through the skin, thinks through the brain and loves through the heart. That living force when it leaves this body, the body is like an automobile without a driver, it has no capacity to function. That atma is Sachidananda, eternal full of knowledge and bliss. And what is the quality? Krishna tells in Bhagvad Gita – mamaivamso jiva-loke jiva-bhutah sanatanah, Every living being, this jiva, this spiritual force is part and parcel of Krishna like a sunray to the sun. Qualitatively gives heat and light like the sun, but quantitatively the sun ray is always just part of the sun. It’s never the sun. And the sunray is always coming from the sun. The Sun never comes from the sunray. So simultaneously it is one and different. That is our relationship with the Lord. We are one in quality. In the Bhakti tradition, the highest oneness is realized when our hearts through love merge eternally, infinitely with Krishna’s will. When we taste Krishna’s infinite love and Krishna tastes our love. But still, for the purpose of Rasa, for the purpose of relationship we remain individual. Similarly material nature is one with God and different from God. Because the Shakti, the energy of the lord is coming from the lord. The Ishopanishad tells that the absolute truth is perfect & complete and everything emanating from the absolute truth is perfect and complete. When Krishna tells in Gita, aham sarvasya prabhavo, All spiritual and material worlds are emanating from me, the source of everything. So this material world is God as his energy. But at the same time it is not God because it is his external energy. But energy and the energic are coming from same source, and similarly God himself is achintya bheda bhed tatva. He appears as Varaha, Narsimha, Kurma, in countless incarnations as Lord Ramchandra, the son of Dashrath. He appears in original form once every 4 billion 320 million years as Krishna, the son of Nand and Yashoda and reveals his Vrindavan past times. Now how is this one and different? Now let’s just think about it from a practical way, because sometimes philosophy can best be understood by practical meditations. The cowherd boys are wrestling with Krishna. Yes! And they are defeating Krishna. Nobody can defeat Krishna but because their love for Krishna is so much as playful friends and they want to please Krishna so much, they know that Krishna will be pleased if they defeat him and so they are trying to win just to make him happy. And Krishna loses, just to make them happy, that’s their love, that’s Vrindavan. Narsimhadeva, he was roaring… all the demigods were afraid to come near him, even Laxmi! Brahma said, “Laxmi, you go and pacify him, he is your husband.” Laxmi just looked at him and said, “I just don’t know him like this.” It was little Prahlad who came forward. And as Krishna, gopis are just chastising him, mother Yashoda with a stick…. Can you imagine mother Yashoda with a stick to Narsimhadeva? Though he is same person! So this is achintya bheda bhed tatva – the Lord is inconceivably one and simultaneously different with one himself. And this is his greatness. We read that there were 3 external reasons and 3 internal reasons for why Krishna appeared in his original transcendental form The 3 external reasons why Lord Chaitanya Mahaprabhu appears in this world are revealed by Krishnadas Kaviraj Goswami. That again and again in this world when there is rise in irreligion, and a decrease in religion & true genuine principles, I descend into this world. Krishna comes to reestablish the truth, Krishna tells in Bhagvad Gita, “what is the truth?” – To understand that all living beings are in me, of me and are mine. To reveal to the people that we are strangers in the foreign land, for the eternal soul to try to be happy with the cheap thrills of this temporary pleasures of this material existence is really an embarrassment. But sometimes when a person is so intoxicated, they put themselves do things that are so embarrassing, humiliating and they don’t even know that they are doing it. That’s the deluding potency of Maya. All we have to do is to choose to do so and Krishna descends to show us the way, Sanatana dharma! Our eternal religious principles! The lord also came to establish the Yugadharma. In every age, there is a very effective powerful simple way by which we can realize our love for Krishna. In the age of Kaliyuga it is Hari Kirtan, the chanting of the names of lord. And the third reason is his loving devotee Advaita Acharya, who was the reservoir of profound compassion for every living being, he prayed and cried for the Krishna to come to shower his love upon us. Srimati Radharani is the Alhadini Shakti, the pleasure potency of Supreme Personality of Godhead. She is the ashraya vigraha, the abode of all love, devotion, and grace. Krishna is the object of all love. Radha and Krishna are one! The one supreme truth in two forms for the sake of exchanging the deepest pleasure of spiritual love, they expanded themselves into unlimited jiva, like us, just to participate in their love. This is the beauty of the spiritual world, it’s not just only a void; it’s not just only a vibrant impersonal energy, that is there but beyond that there is dynamic relationships of the most intimate ecstasies of love between God himself and all of us who are his parts and parcels. We are all created only for that purpose. But for Love to have depth, feeling and satisfaction, it is most perfect when it is by our free will. And all love is ultimately emanating from Srimati Radharani. Krishna was feeling that the pleasure she is experiencing in tasting my love is something that even I can’t understand. I’m the giver of the love, but I want to taste what the receiver of my love is feeling. Because she is happier than me and I’m supremely happy. This is inconceivable, Krishna is supremely happy but Radha is even more happy! How can something which is unlimited, absolutely full and complete can have something more? That’s what God is about! Inconceivable, dynamite of Pleasure! Of Love! What is the nature of Radha’s love? What is it about him that awakens so much love in her and what does she tastes when she feels his love? So Lord Chaitanya was Krishna with Srimati Radharani’s complexion and her devotion. Especially for this purpose, he combines it with the Yuga avatar which is establishing the process of self–realization for this age; but like no other Yuga avatar because Lord Chaitanya is not just giving love of God and liberation in Vaikuntha, the most Yuga avatars give; he is giving the love of Radha, the love of gopis, the love of Vrindavan through Harinaam Sankirtan. Thus Rupa Goswami says he is most magnanimous. And he takes such a humble position in the role of his devotee! To teach by his own example! When the lord descends into this world, he doesn’t come alone. He sends intimate associates from the spiritual world, before him and with him. The story of Ram Leela, Dashrath, Kausalya; they are the eternal parents from Vaikuntha, they descend before the lord to facilitate and reveal the love between them to this whole world; they invite the world to enjoy it. Yashoda, Nand, Balaram, the principle gopas and gopis, they descend from the Goloka. And many purified souls in this material world, the “Sadhana…” they rise up to perfect their devotion by association with these nitya siddhas from the spiritual worlds. So Lord Chaitanya first he sent many of his precious loving devotees. Many of them were born here in Navadwip. Others were born in different places. Pundarik Vidyanidhi, Mukunddutta, and Vasudevdutta: They appeared before the Lord in Chittagaon. Haridas Thakur near Benupur. Rupa, Sanatana Goswami– they were going to be, near Jaswar. Nityanand Prabhu in Ekchakra. Parmanandpuri in Trihuta. And quite a few devotees appeared in this select area. They are known as Srihatta. Advaita Acharya in Nabagram. There was one very great devotee. His name was Upendra Misra. He had seven sons; one of his sons was named Jagannath Misra. Upendra Misra was a great devotee, his father was Madhukar Misra who came from the western province of India and later settled in Bangladesh and gave birth to his children. He was very powerful Vaishnav. Jagannath Misra came to Navadwip for his studies. Nilambar Chakravarty was also from that select area, he was living in Navadwip and was a great scholar. He had daughter named Sachi, most beautiful pure hearted loving person. When Nilambar Chakravarty saw the qualities of Jagannath Misra, in his heart he knew they should be married. They were none other than Nand and Yashoda from the Brijbhumi, they settled at a little house not far from here on the bank of the Ganga in Mayapur. What was Navadvip like in that time? Our scripture and our biographers tell that Navadvip was the highest seat of learning in all of India, from scriptural perspective in all of world. This is about 500 years ago, scholars from every part of India was coming here and learning under teacher. Where we are sitting now, it was incredible empire of knowledge. It was like city there were millions of people coming here. But everyone came here for knowledge. In Navadvip, you had no prestige if you weren’t a learned scholar. Having money… anybody could do that!!! No prestige in having money. Having power and fame… so what being a prime minister or a king… go to your castle and waste your time!!! Having all kinds of beautiful families and everything else…. yes we want to enjoy it but there’s nothing special about that!!! Knowledge, scholarship, erudition was the standard that everyone wanted to have. Every parent did everything they could to make their children into scholars. And when it came to marrying their daughters… scholars… Pandits , my daughter will marry a Pandit who will defeat all other Pandits. Every one carried their books. And when you carry a book, you had to defend that book because everyone would be challenging each other. If he didn’t know your book you make a fool of him. So different levels of books and according to the book that you are carrying you have a prestige. Somebody sees you carrying the same book then there will be a battle of the intellect to see – who is the best at that book? And if somebody carrying a higher book, you would hide. This is Navadvip. There is 6 systems of philosophy according to Vedic philosophy – Sankya philosophy, Vaisheshika philosophy, Karma philosophy, Vedanta philosophy, Nyaya philosophy and Yoga Philosophy. One who had mastered all these 6 thesis is considered the scholar. Now here in Navadvip 5 out of 6 had powerful learned scholars all over the place but the Nyaya philosophy they didn’t had an authoritative school and this was the one defect. They had everything, the most powerful scholars where people from all over the world can come and study but not Nyaya. The reason is, you have to have the book to teach and the only place on the planet earth that had the book on Nyaya philosophy is Mithila – Very sacred place. Mithila is where very close by where Sita was born. It is the place where Ram came with Laxman and Viswamitra and broke the bow of the Lord Shiva, that Ravana and many of the great kings could not even pick up from its alter. Ram lifted it, threw it in the air and caught it, strung it, pulled the string, and broke it. Mithila is the place where Rama and Sita were married. Very holy place, if you want to study Nyaya you had to go to Mithila. It was like a monopoly situation, the scholars of Mithila they had their book, and they would not give out copies of even a single page to anyone, and it was a big book. Sarvabhauma Bhattacharya, he was one of the great scholar, and professors of Navadwip. He went to Mithila to study Nyaya. You know what kind of scholar he was? He heard from his teachers and memorized every word of it, came back to Navadwip and wrote down everything he memorized. These are the kind of scholars that we are talking about. Because he was so brilliant, he expanded on it, he took the authorized sastra of Nyaya and then wrote commentaries that can give such incredible depth that no man has ever seen. From that point on, Navadwip was the unparalled high seat of learning for the world and literally, millions of students were coming here, they were coming from Varanasi, they were coming from even Mithila to learn Nyaya, because it was better here. They were coming from South India, from Kanchipuram, from Srirangam, they were coming from Mathura, everywhere, and yogis were coming from the Himalayas. It explains everyday there were thousands and thousands of students, who were leaving Navadwip with their diplomas, to show everyone that ‘I have graduated from Navadwip’. You know if today you graduate from Oxford or Cambridge, Harvard, MIT, or hate to say even IIT, that doesn’t have even a fraction of the prestige of getting a diploma from any professor from Navadwip. I was in London during the Olympics this year. Can I interrupt my flow by just telling you something I saw there? (Haribol). The world is so deceiving, because, before I went to London, I always had programs, and most of these were in the city. In America people were warning me – Don’t go to the London during Olympics, there is going to be so much traffic, it is going to be so overcrowded. There is going to be impossible to go anywhere, don’t go, there was all kinds of information being sent out by London, unless you are coming to the Olympics, don’t come to the London. Because it is going to be so much congestion. Somehow the devotees in London setup these programs during that time. So I went, and I was expecting so much traffic and jam, one thing they told me is – All most all the big roads in the city, they made an entire lane only for Olympic athletes and journalists. Unless you had special Olympic authorized car, you couldn’t go in that lane. And in England the roads are kind of thin, and half the lanes are not there. So there is going to be so much traffic, and it is going to be very difficult, I was expecting that. I was thinking, it can’t be any worse than Mumbai and What to speak of Kolkata. I arrived, and I’m staying downtown, we are going from the airport, we were driving around and there was nobody there! I go to London every year, I never saw such a little traffic. There were the lanes that were reserved for the Olympic people, there were more people in that lane than all the other lanes. The taxi drivers were totally distressed, because nobody wanted a taxi, because there was no one around. The shopkeepers were really in distress, because they stocked up for all these people who were coming for the Olympics, and nobody was around. What happened is the Olympics were at another end of London. So all the people who went to the Olympics, God knows how many they were, none of them came downtown, because they were afraid of be too congested. And from around the world if you didn’t go to that place, no body went there because they were afraid of it is too congested. So this little swami was practically all alone, it is very nice actually. But anyways, sports are very important. In India I know a devotee, I am not going to mention the names, because it might be some one among you. But when India lost to cricket match to Pakistan, he actually decided to commit suicide, it was before he was devotee, and on his way to a bridge, somehow, someone gave him a Bhagavad Gita. And he was receptive, it was one thing that you get Bhagavad Gita, and it was another thing when you are about to commit suicide, because Pakistan just defeated India’s cricket team. In America baseball, football, basketball, and soccer and in other places cricket. If you put all these sports together and multiply by thousand, you don’t get the popularity of scholarly debate in Navadwip. When scholars were debating the whole society was at the edge of their seats, they all had their champions. But it was all mundane. There was so much false ego, it was all just based on ego. Who knows more? Who could defeat somebody else? Who has more information? Even in the name of spirituality, it was all materialistic. People were worshipping, people were spending massive sums of money for the weddings of their children. To get the blessings for the material prosperity and scholarship, people were worshipping snake goddesses, to get material blessings. This was basically what Navadwip was about, and it was incredible. There were just a small group of devotees here, headed by Advaita Acharya. Srivas was here, Murari Gupta was here, Srivas’s brothers and Haridas Thakur. These devotees, it broke their hearts, no one would chant the names of God, and no one would chant the names of Krishna. For them at the best God was just the order supplier, he wasn’t a person to surrender to, he wasn’t a person to please. Yesterday we were speaking little about the karma mimamsa philosophy. Krishna told Nanda Maharaj that Indra or even Iswara, God, they must give you what your karma deserves. Just do good karma and God will give you good material benefits. Even though material world is a miserable place, if you have really good karma and if you are really good then you can enjoy this world to the topmost, God will supply it and that is the perfection of life, there is nothing beyond. That’s the beast most deep spiritual concept that was here. For most it was just conquering others, defeating others, fulfilling our envy, our arrogance. And when the devotees saw this, they cried, because the quality of a devotee is he is para dukha dukhi, the suffering of another is my suffering, the happiness of another is my happiness, because there is love, just like mother. I remember, I went to see my grandmother, she was very very old, and she couldn’t function so well, she was lying on bed. I hadn’t seen her for a long time, and my father was there. My father wanted to make sure that she knew who I was. 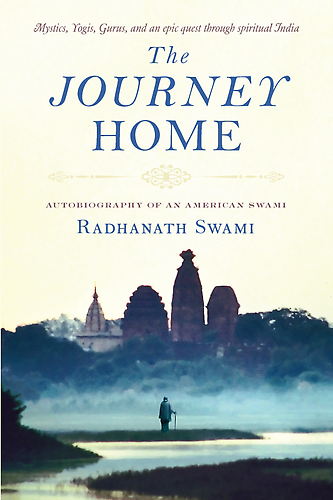 So, he said, “This is Radhanath!” I was not swami then. He said, “This is Radhanath. He is a Hare Krishna!” and my grandmother looked at me and smiled. She had tears in her eyes and she said, “Hare Krishna.” She said, “If it makes you happy, it makes me happy.” So even in this world the nature of love is the happiness of the people you love is more dear than your own happiness. And the suffering of the loved one is the worst thing that it could happen to our heart. Devotees love the soul, now as for listening to this narration, try to identify with it, how much am I really a devotee, how much do I really have this character of para dukha dukhi? A Vaishnava is one who is totally free of selfishness, in the love for Krishna becomes such an instrument of Krishna’s compassion in the world. We are trying to be Vaishnavas, we shouldn’t be proud about it, we should be humble. The devotees because of their ecstatic intimate love for Krishna, they would chant Krishna’s names, and as they were chanting Krishna’s names, they would feel the ecstasy of Krishna’s love. But at the same time they couldn’t bear seeing their loving brothers and sisters in the form of all living beings deprived of it. ‘durlaba manava janma lobhiya samsare ’, Thakur Bhakti Vinod explained this human life is so rare, when a devotee see someone has to attain this human life, the scriptures tells us 8,400,000 species of life and generally the atma, the living force, passes through evolutionary cycle from one species to the next to the next, from plants to fish to insects to reptiles to birds to animals There were so many thousands and millions of species within each of these species. Finally the human birth, ‘durlaba manava janma satsange taraho ei bhava sindhu re’. This human life is so rare, because in this human life, we can, ‘athato brahma jijnasa’ we can question our existence – Who am I? Where I am coming from? Why is there suffering? What is the cause of suffering? Who is God? What is my relationship with God? What is the purpose of my life? Only a human being can ask these questions, it’s so rare. To die as a human being without pursuing and receiving the true answers to these questions is such a loss. It’s like you have the most precious Jewel but you just take it to be ordinary glass and you spend your time playing with other kinds of glass, never utilizing what you have. And the people of Navadvipa, the scholars they hated the vaishnavas. They criticized them, ridiculed them, and persecuted them. Why? One is, they has so much arrogance they could not conceive of anybody with another conception than their own. And devotees were giving their egoism and selfishness for higher principle, and if there is a higher principle, that makes them look really bad because that was their goal in life, to fulfill that. These scholars of Navadvip, literally, this is what our biographers said, they persecuted, criticized and threatened devotees. They would write songs blaspheming the devotees and going to the streets and publicly sing them on a regularly basis. Sri Chaitanya Bhagavat tells some of the songs even. Something like – a recluse ascetic who has surrendered his life to God and a chaste lady who lives by high cultural dignity will get grow old and get diseases and will die like any other sinner. So what is use of all your worship of God? Real success, real enlightenment means when you are carried on golden palanquin and you have hundreds of people in front of you playing instruments and chanting your glories. That is enlightenment. And these vaishnavas, they are screaming Krishna’s names and they think that they are holy? They are lowly. How would you feel when somebody screams at you? Does that make you happy? By screaming Sankarshan Nitai, that doesn’t make him happy. They are screaming at God you think that makes God happy? That makes God sick, makes him disgusted, it disturbs God, it’s a blasphemy of God. This kirtan is nothing but blasphemy. Srivas Thakur would have kirtans in his house and these people would say they must just break down this house and throw it in the Ganga and throw Srivas and his brothers in it. These were the kinds of songs they were singing on the streets for the public to hear. Can you imagine if they had internet! And the devotees loved them unconditionally they just wanted to help them. The devotees could have just left them and could have been together and started some ashram in some jungle and been happy. But how could they be happy with all these people in such illusion? Advaita Acarya was the most respectable person of Brahmana community. All the other devotees were blasphemed, persecuted and criticized but Advaita, he was so learned, he was coming from such a high birth of Brahmans, he was literally the leader of the Brahmana community. He was so well respected, they didn’t directly say anything against him like all the others, but he felt the pain more than anyone else. Not the pain of what they were saying against him or the vaishnavas, but the pain of what they were doing to their own lives. Advaita Acarya saw that this is just the beginning of kali Yuga, what’s about to come? It pained his heart so deeply that he made a vow. “I have no power, none of the other devotees have any power, to transform these people’s consciousness. I don’t see anyone seeing chanting the name of hari anytime, except sometimes when they are taking bath in the Ganga as a ritual.” Advaita Acarya made a vow –only if Krishna himself from the highest plant in spiritual world, Goloka Vrindavan, descends then He could give bhakti to these people. He read in a scripture called Gautamiya tantra that anyone who offers tulsi leaves mixed with Ganga water to the Shaligram shila with love and devotion, Lord Krishna will fulfil that persons desires. He was crying, offering tulsi leaves and Ganga jal to his Shaligram shila, weeping and begging to Krishna to descend to spread the glories of holy names to help these people. Day after day, week after week, month after month, year after year incessantly he was offering these prayers. Sometimes he was so emotional with compassion he was roaring the names of Lord Hari, and weeping. His feelings, emotions, compassion was so deep – that transcendental sound is not limited to time or geographical considerations. When with a sincere earnest heart and a humble disposition we cry out the name of Krishna, we should understand whether it is kirtan or japa, when we chant the name of Krishna with a sincere and intent heart that sound vibration covers the entire universe. That sound vibration reaches the spiritual sky. In 1967 Srila Prabhupada had just established our society and he was very ill. He told the devotees he was going to Vrindavan from America. He said, “If I must leave this world I must leave in Vrindavan and there is no better place for me to get good health than in Vrindavan, my home.” So they were all new devotees, the senior most devotees were 2 years, what to speak of most of the others they were only of few months. They had given up everything and given their hearts and souls in loving service of Prabhupada and now he was leaving, and may not comeback. They were crying and weeping and Srila Prabhupada looked at them with great gravity and smiled and said, “If you are chanting Hare Krishna and I am chanting Hare Krishna we will always be together. There is no material limitation that can separate us.” That’s the nature of transcendental sound and according to purity of heart Krishna reciprocates by manifesting within the name when we chant. Krishna heard the calls of Advaita and decided to come. Haridas Thakur and Advaita Acarya, were chanting the Holynames and doing the puja day and night and were crying for Krishna to come. Srivas Thakur was dong kirtan with his brothers and other devotees praying for Krishna to come, for us. Sacidevi and Jagannath Mishra they gave birth to 8 daughters and each of them died just after their birth. How tragic that is! For a mother to carry a child with such affection and motherly expectation in the womb for 9 month and the father in such expectation of having a child for 9 month. Then going through the process of birth and then it dies, eight consecutive children. They worshiped Adhokjaja Vishnu, their family deity. You see they are Nanda and Yashoda, their desire to have a child was a pure offering of love to Krishna. To bring a child in this world to serve and love Krishna, that’s an offering. When Bhakti Vinod Thakur prayed for Bhakti Siddhanta Saraswati, for Krishna to send one of his own personal associates to help expand this movement, that’s an act of deep love. Our acharyas and Srila Prabhupada teach, this is the opportunity grihastas have in having children – To do it as an offering of love and there is a way of doing it that way. Their pure hearts, they worship the lord because the lord wanted to take birth as their son. And then they had a little baby boy, his name was Vishvarupa. And he lived! Srila Prabhupada explains that some time people worship God when they have a problem, but when problem is solved they say, “Thank you! Now I have other things to do.” But they increased their worship to God, their love and their devotion and puja because they were so grateful. Then it so happened, in the month of Magh in the year 1485 the supreme personality of Godhead Krishna, who was going to come to taste sweetness of Sri Radha and to spread that love throughout the world. With that love the Lord entered first into heart of Jagannath Mishra, he became totally ecstatic. Lord was physically present in his heart, then from his heart the Lord by His own sweet will transferred himself into the heart of Sacidevi, then he entered into her womb. It was nothing like what humans and other species do to have children. It was a pure divine arrangement, Gods decent. When Saci Devi became pregnant she became effulgent with light. She was experiencing such deep happiness, everything seemed to become totally auspicious around her. People would just see her and start offering obeisance to her and they didn’t even know why, it was just natural. People were coming and giving gifts to them. It was in the month of Phalguna in the year 1486 by western calendar, the sun set in the town of Nadia, Navadvipa is 9 islands, and HH Bhakti Purushottam Maharaj gave a brilliant class yesterday, where he described how Navadvipa is like a lotus flower. And eight of the islands are like eight petals of a lotus and Antardvip like whorl of lotus. In center of Antardvip is Mayapur and in center is Yogapitha, the house of Jagannath Mishra and Saci Devi. As the sun was setting the moon rose over mother Ganga. Kaviraj Goswami explains when the pure spotless moon of Gauracandra is going to rise in Navadvipa what is the position of the moon full of spots, so considering this there was an eclipse. Now for other people the eclipse is the most inauspicious time and for some it’s the most auspicious time. But it was a lunar eclipse, moon completely covered by Rahu. At that time it is custom of everyone in order to protect themselves from inauspiciousness, at that time all these great scholars, who very egoistically and materialistically oriented, they were really into auspiciousness. It was at that moment, as the moon was rising, the full moon, that Lord Gauranga appeared from the womb of Saci Devi and manifested himself in this world. He was so beautiful. His complexion was luminous with a golden aura. His eyes even though He was a small child…… Now swamis have their perception of babies, I’ve been to Bhaktivedanta Hospital and some devotee’s babies born, they show them to me and ask “Isn’t he beautiful?” Now this is like a material conception of premanjana churita. The mother looks at the child, the child looks kind a like a raisin all shriveled up. New born babies are not objectively very beautiful. But Lord Gauranga was beautiful objectively and subjectively. He had beautiful lotus like eyes. And as he gazed at people and he smiled, his face was like a beautiful moon and lips like bimba fruit and nose like a sesame flower. His hair was cascading around his head and every limb of body perfection of sweetness. Everyone just fell in love with him. Jagannath Mishra was a simple Brahmana, he did not have much material possessions. When this Brahmana made these predictions, he wanted to give him so much in gratitude. But he had nothing. All he could do was fall at feet of the Brahmana and weep tears on his feet. And Nimai was born, under an Neem tree. The Neem tree had very bitter leaves, sometimes people eat Neem leaves so that mosquitoes don’t bite them. If you eat enough Neem leaves, your blood becomes bitter and mosquitoes don’t like you, I tried it. I got malaria, so people said, “You don’t want to get it again, so just eat these Neem leaves” So I was eating these Neem leaves and they were really bitter, the mosquitoes were still biting me. I guess as kaliyuga progresses even mosquitoes lose their discrimination. Because the Neem is so bitter it’s like a symbolic traditional idea that any inauspicious being like ghosts or other supernatural astral beings will not come near a Neem tree. And because eight of her children already passed away Sacimata gave birth to Nimai under a Neem tree. She gave the name Nimai. Some of the neighboring ladies who were there, the relatives, they said because he is as beautiful as Krishna, Lord Hari with a golden complexion we will call him Gaura Hari. And Jagannath Mishra and others said, “Every limbs is so beautiful and attractive, it’s melting our hearts with love. So we’ll call him ‘Gauranga’, one who has golden limbs.” He brought joy to everyone. Even though he was just a new born infant still he has all the power of Krishna, Rasabihari, Gopinath, and Madhava. His smile enchanted everyone’s minds and hearts. He glanced upon them with smiling face and it was like pools of bliss would fill them. And he saw how much happiness that gave them. You know what Nimai did? Anytime there wasn’t chanting in the house he would cry and as soon as he cried it broke others heart so much that everyone came around and clapped their hands and chant the Holynames. When they stopped He cried, Kirtaniyah sada hari. In the house of Nimai Pandit there was constant chanting the Holynames of Krishna. And every one was totally united, this is Bhakti. When we put Krishna in center, Sri Chaitanya Mahaprabhu did not just come to teach us Kirtan, He taught us Prem sankirtan, kirtan of ecstatic love. When we come together in kirtan this is our goal, our hearts are totally united to give pleasure to Krishna. All our egoistic conditioned differences we have no relevance – We may have different opinions, ideology, natures, we may have accidentally stepped on each other’s feet, whatever we may have done, we may be black or white or red or yellow or male or female, we may be from India or Pakistan, America or Russia, may be Brahmans, vaishayas, Kshatriyas or shudras, Lord Chaitanya taught when we come together in kirtan we are chanting to please Krishna, when we come with that motivation we become loving brothers and sisters. Srila Prabhupada took the most profound siddhanta of the deepest philosophy and brought into a simple package. He said, “Just keep Krishna in center and you’ll be happy and you’ll attain perfection.” What does it mean to put Krishna in center, it means to put one selves out of the center. We have been suffering from birth after birth in this material existence because we wanted to be the controller, the proprietor and the enjoyer. How do we take ourselves out of the center, the ego is so conditioned and it’s so deep and gross and so subtle, Paramdrshtrva nivartate, it is possible when we experience something higher and that is to put Krishna in center. Even in the name of religion or even in the name of Bhakti we have so many reasons to hate each other or envy each other, to criticize each other, that means we are putting ourselves in the center. Lord Chaitanya taught this principle even when He was an infant, to bring everyone together. They were chanting simply for the pleasure of Nimai. And He was reciprocating by smiling and glancing and the love of His heart was shining upon them infinitely. Everyone was feeling His love and the love of their hearts was shining upon him infinitely. The whole expression was a united sangam to give pleasure to Nimai by chanting His holy names. This is the blessings of the Navadvipa dham. We will continue tomorrow.